Have you found an online vendor selling Facundo Exquisito? This is my first review, and I am excited to do it on "The best Sipper" i have tried thus far. The bottle sets it off from the start with it classic design and beautiful labeling. The cork is unusual then a normal cork( it don't catch or get discoloration from the rum) placed in a brass top. Now the contents in the bottle, dark red in color must say one of the darkest rum I have ever had. Must be from the finished in sherry casks for at least a month, FACUNDO EXQUISITO is incomparably mellow in profile. From the time you take the first sip you be surprised how mellow it is, but after you let it a irate after a few its incredible almost sweet in taste, This is what catches me every time I drink it.Price was just under 100 and I believe it's worth every penny. I may go pick up the last one they had at my liquor stor and I hope you enjoy yours. A very good rum, recommended 100%. It has a very good presentation very showy and striking, when served in a cup you can see a very nice mahogany color, and a very balanced flavor as well as the aroma. Un ron muy bueno, recomendable al100%. Cuenta con una muy buena presentación muy vistosa y llamativa, al servirlo en copa se aprecia un color caoba muy agradable, y de un sabor muy equilibrado al igual que el aroma. I have bought and enjoyed all of the dark Facundo rums and this one is by far the best. Much better finish than the Paradisio a d half the price. Great nose and excellent finish. Slight hint of sweetness with lots of dark fruits. After trying most of the high priced rums, this one is The Favorite. Well balanced, easy to drink, not too sweet, not too dry, not too strong, just right. Has all the tastes and qualities that you look for in a rum. In my opinion, there is no need to look for the perfect rum anymore. This is a rum that you do not want to use in a mixed drink. Why spoil a work of art. A must in a collection. However, it will not last since it will be the one that you will drink. Better buy more than 1 bottle. Not too expensive at $90. Let me be upfront, it was the bottle design that got me curious about this. At the time I though "Facundo" was just another brand of premium rums but learned soon that "Facundo" was, in fact, Facundo Bacardi of the Bacardi Rum conglomerate. The rum itself is a blend of different rums aged between 7 and 23 years in American oak barrels in the Bahamas. And if that weren't enough the rum blend is then finished in sherry casks for about a month or more and hand bottled in Tultitlán Mexico. I like the art deco design on the bottle. Photos do not do it justice. It is a beautiful gold leaf. The cap is metal with a wide rubber cork. Brace the bottle well when pulling that cork out. Mine was TIGHT. Made a bit POP sound when I got it out. The color of the rum is a rich, dark mahogany fading to a golden hue in the shallower points of the snifter. The aroma is wonderful. When I tasted it I noticed a marked vanilla flavor and a sweetness to it (sugared?) but not overly sweet (tempered by the sherry casks perhaps?). Extremely smooth. There is a distinct oakiness to it but not bitter. The finish reminds me of toffee. At $90-$100 USD a bottle this is not a rum you pick up on a whim. This is a rum for special occasions and for display. This is an extremely well-crafted rum in a well-crafted bottle. Highly recommended as a sipping rum. It would be a crying shame to use it any other way. Hints of pineapple, coconut and caramel with a dry yet sweet balanced body. Very nice sipping rum. The only downside I find is... if you are going to make an expensive rum, and a nice packaging... then go all in and make the top cork, not planstic (like this one is). Having lived most of my life in PR i’ve always been bummed that no good aged sipping rum existed from the island (until DonQ reserva came out at $1.5k a bottle) this is the much more affordable at $100. Flavor is similar to Plantation XO but with much more body, less pineapple, and more caramel notes. Bottle and brass cap are beautiful, only negative is that it has a rubber cork, go all in bacardi! The first thing that grabbed me was the wood, but not overly bitter. Then the cherry, pineapple, molasses finishing with a slight vanilla and coconut flavour without ever being too sweet or too dry. A very fine balance well kept. Notes of honey and roasted pineapple and lovely barrel. Nearly a perfect rum. A great rum from opening the box to finish. I like a nice bottle, and this one is a show piece but...it’s whats inside that counts! Beautiful chestnut colour and brown sugar/molasses nose. Definitely a hint of vanilla in there. Tasting notes are vanilla, coconut and a touch of banana. A little burn on the way down is all good. Reminds me of Zacapa 23 - a great rum all around and well worth the $90 price tag. Nose was sour, rather would not know how they did it, and the taste was oak wood and nothing else. This is the best in the Facundo line. 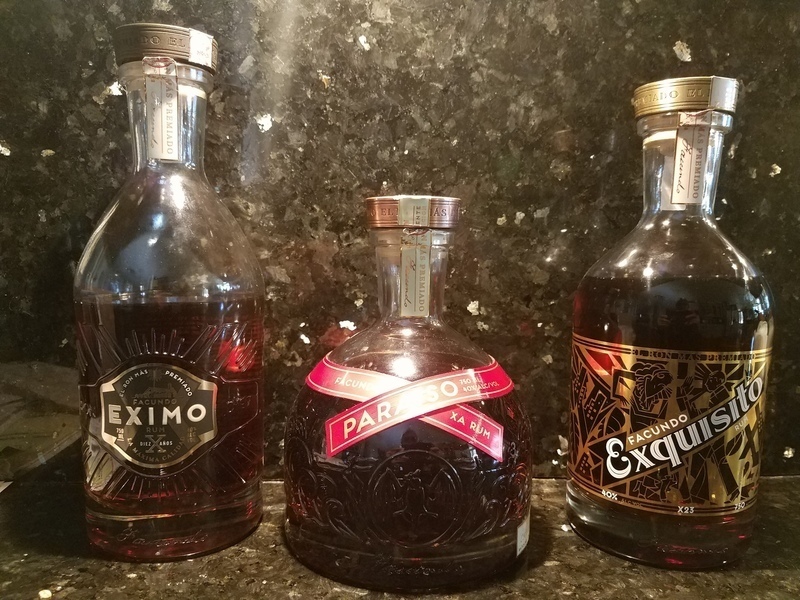 It takes the Eximo's fruity and spicy flavors and adds a layer of tropical vanilla and coconut flavors. Once you nose this rum, you feel a smooth, pleasant aroma. The taste is perfect, smooth, a little bitter but not sweet. Great rum! Truly good, rich and well balanced rum. Taste is rich and full. Hints of smoke and spices. Pleasant long aftertaste which is bit bitter. tbh rum is good but not value for money. If it would cost half a price I would rate it 9. I like this rum a lot. I also like the art noveau design on the bottle and the packaging. It is a rum that as a sipper tastes like it costs more. I have not tried the other Facundo rums but they have done an excellent job with this one. Just a notch below the ron zacapa xo and ron abuelo centenario both of which got a 10 from me. This is a lightly flavored yummy molasses rum with zero burn on the back. If this was cheaper, I would drink it more often. I have it as my number 2 rum. The color is nice, the scent is a bit strong with alcohol, bit there is a strong touch of coffe.. In the mouth there is not much going on.. The finish has a strong alcohol kick and then the pallet comes to life.. Great notes, a bit dry for my taste.. 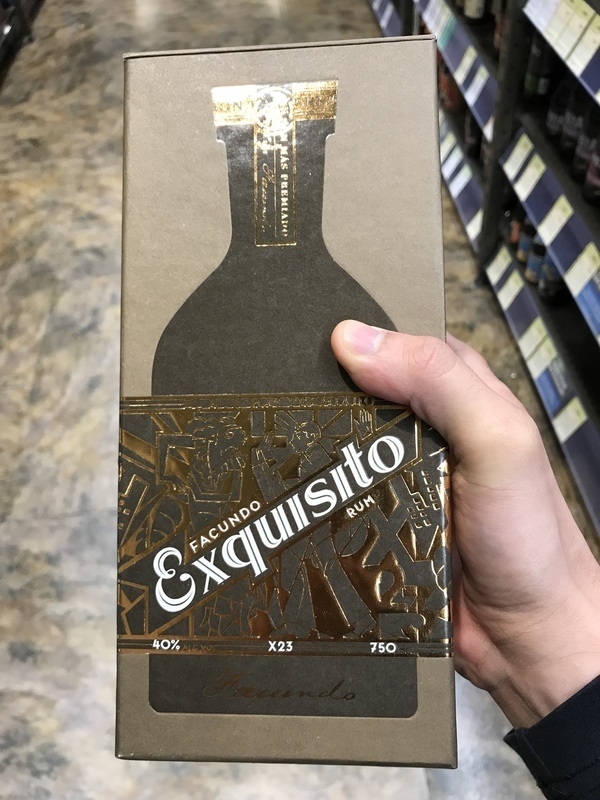 But it lasts long..
Facundo Exquisito is very smooth with no afterburn at all, but there are no clear flavors to taste and you will always get that familiar Bacardi undertone. 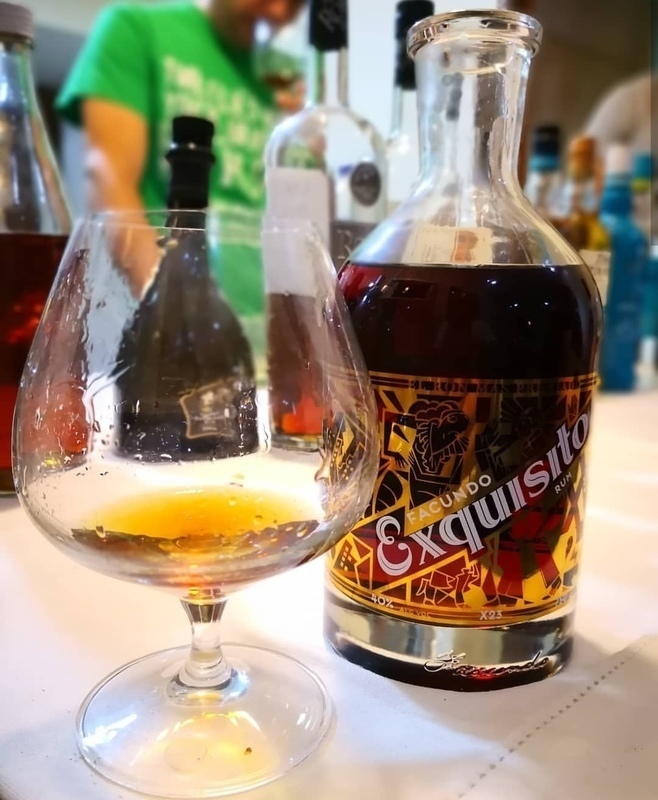 There are well over 50 smoother rums with much better price tag than the Facundo Exquisito. For the price, the may be the best rum on earth! Vanilla, butterscotch, lingering amaretto and brown sugar on the palette. Very nice rum. Excellent work here and I agree definitely a step above Eximo with a good butterscotch taste to it. I'm a little surprised that I'm the first to review this given it's widespread availability in the San Francisco Bay Area (BevMo! even carries it). This rum is very impressive; it's a high 9 score imho. Butterscotch, vanilla, oak, and light sherry make this a great rum. Smooth and easy drinking at 40%abv, this rum is VERY good for a Bacardi product. After I tried this, I tried the Facundo Paraiso, which is even better than this!